Alphabet samplers make great projects! Stitch the whole sampler or use the letters to make monograms. These letters are lovingly adapted from antique	Victorian cross stitch charts and updated for the modern stitcher. Enjoy stitching! 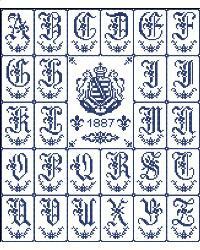 Cross Stitch Pattern:	Alphabet Sampler Laurel	Design Source:	Antique Chart Adaptation	DMC Colors:	1	Stitch Count:	163	x	191	Approximate Finished Size on Recommended Fabric:*	14	count =	12	w	x	14	h	Inches	16	count =	10	w	x	12	h	Inches	18	count =	9	w	x	11	h	Inches	22	count =	7	w	x	9	h	Inches	*Pattern sizes do not include margins. Ideally you should add 3" on all sides. Uses full	cross stitches only.